This is a special article from guest contributor and OS user Smirkin Dirk. Australian football. For us Australians, it arouses passions only seen in love and war. For Americans, it is that weird sport that sometimes makes the Sportscenter Top 10. Greater Melbourne has roughly the same population as greater San Francisco, and we sustain 10 professional teams. The teams average between 25,000-50,000 fans per game, and the TV rights to the league were sold for $2.5 billion. 30 years ago, the league was rooted in suburban rivalries with rotting facilities and creditors kicking down doors. It is now a slick, monetized TV product with indoor dome stadiums, kiss cams and analysts using telestrators. Baseball fans have The Show, NFL fans have Madden, NHL fans have the appropriately named NHL series, and we NBA devotees have been bestowed the glorious NBA 2K series. AFL fans have not. EA Sports developed a game in the late 90s; it looked like pixelated sludge. It got even worse in a mid-2000s AFL game where a slightly rotund player was portrayed in a very unflattering manner — with 50 kilograms added to his player model and bright red hair. The reason why is the stuff of urban legends. But finally it appears AFL fans have a game that’s actually playable. AFL Evolution has just been released; Wicked Witch is the Australian-based developer. Our superstars have been face-scanned, stadiums have been modelled accurately and, most importantly, many aspects of AFL football have been represented well. Many Australians believe we have the best sport in the world, but it’s hard to understand for someone unfamiliar with it. That being said, maybe Madden is too far away, or NBA 2K is too much of a grind and you want a new digital sporting experience, but have no idea about our sport. This article is for you. The sport is played by 2 teams of 18 players each (loosely broken up into 6 forwards, 6 midfielders and 6 backs). There are 4 posts at either end; kick the football through the middle 2 to get 6 points, kick it through the behinds to get 1 point. Hopefully that explains the bizarre score format. 18.12.120 means 18 goals, 12 behind which adds up to 120 points. I think. Let me check the calculator. Yep, checks out. Oh, and you can’t handball a goal. You know how soccer never changes rules? Well, we’re the opposite of that. We seem to have a “rule of the week” where umpires decide to remember long forgotten rules on a whim. 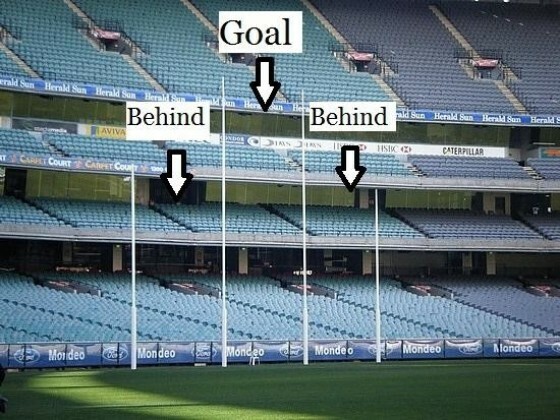 Thankfully, AFL Evolution keeps it simple. If you get tackled after having a chance to kick or handball, it’s called “holding the ball.” You can’t throw it. You can’t bump a player when the ball is more than five meters away. You can’t push a player in the back. You can’t tackle a player above the shoulders. You can’t tackle someone who doesn’t have the ball. You can’t deliberately kick or handball across the boundary line. You can’t kick the ball so it lands outside the boundary without bouncing. These all result in free kicks to the other team. If a player catches the ball that has been kicked 15 meters or more, that is a mark and results in a free kick. If an opponent is having a free kick, you can’t go near him or the umpire will enforce a 50-meter penalty. And the game loves doing this to you. Wow. What a dull paragraph. Kicking. The game has a “free roam” mode so you can practice the types of kicks. I won’t bother explaining the controls as these are accessible in the game menu, but I will explain when to use each one. The drop punt is your most accurate kick. It is mid-distance, and is used to kick the ball to teammates in general play. Hold the modifier and tap the button for a stab pass, which is short distance but flat — perfect for finding targets who lead at the ball carrier. Hold the lock-on button if you want to direct your kick to a particular player. The torpedo is that Fat Boy you have in your Fallout inventory. It can provide massive distance, but a slight overpower and it’s concussing the pie boy 6 rows back at the MCG. It’s called a torpedo because it spins like a torpedo. The grubber kick serves no purpose other than angering this man. The soccer kick is used when picking up the ball would leave you tasting a mouthful of Etihad Stadium turf in a Jack Ziebell tackle. The clearance kick is a hack out of defense where you don’t care where it goes, just as long as the ball doesn’t stay here. It’s an admission of defeat, until the next battle. Handballing. This is a modern football skill. You rest the ball on one hand and punch it with the other to a teammate. It creates fastball movement and showcases the game at its best. Marking. This is the trickiest part of the game to master. A mark is catching the ball from a kick; generally speaking hold the mark button until the circles under the receiver meet. There is a spoil mechanic where the ball is punched away from the marker. This is usually a tactic of defenders, or if you are no good at marking in this game — which at this stage is everyone. The “speccy” is what you would have seen at 2:30 a.m. on Sportscenter. It is when…well, I’ll just let Taylor Garner show you. Remember how I said earlier that AFL football is played by 6 forwards, 6 midfielders and 6 defenders? Modern coaching strategies have made that obsolete. Forwards used to stay in the forward 50 (that line arcing 50 meters out from each goal) but many teams now use what NHL teams would call a forecheck. They move up the ground and try to keep the ball locked in. As a result, if the ball squirts out, there is 100 meters of space that opposing forwards can run into. Teams like the Adelaide Crows do this repeatedly — much to my annoyance. Often teams will play zones around the ground rather than man on man. Or they will play loose players in defense. AFL Evolution does not yet reflect this tactical revolution. It will need to, but is not there yet. Evolution gives you some positional tactics so they are doing some good things in this area, but let me help you out by explaining a bit further. Slow and Wide: If you have a slow midfield with good marking targets, play this way. Kick around the wings, and hope your tall players can pluck marks. This is the safest way to play as teams will have a longer path back to goal if there is a turnover. Fast and Through the Corridor: This is the high risk/high reward brand of football made famous by the great Geelong teams of the past decade, and made less famous by my YouTube clip earlier. Use quick players to get chains of overlapping handballs through the middle. I hope this helps. And if you do see our wonderful game on an obscure channel late at night, don’t flick over. You may just like it.